Was a bit in a hurry again today. I really need to work on getting earlier to bed (and I write that at 1 in the night…) Anyway, just had some cereal again and a low carb yogurt. I used to eat yogurt several times during the week, filled with carb, chocolate and sugar. Same when I got to work if I didn’t get any breakfast before, then some nice yogurt with fruits and sugar. I need to buy one soon, just to check the stats on it. 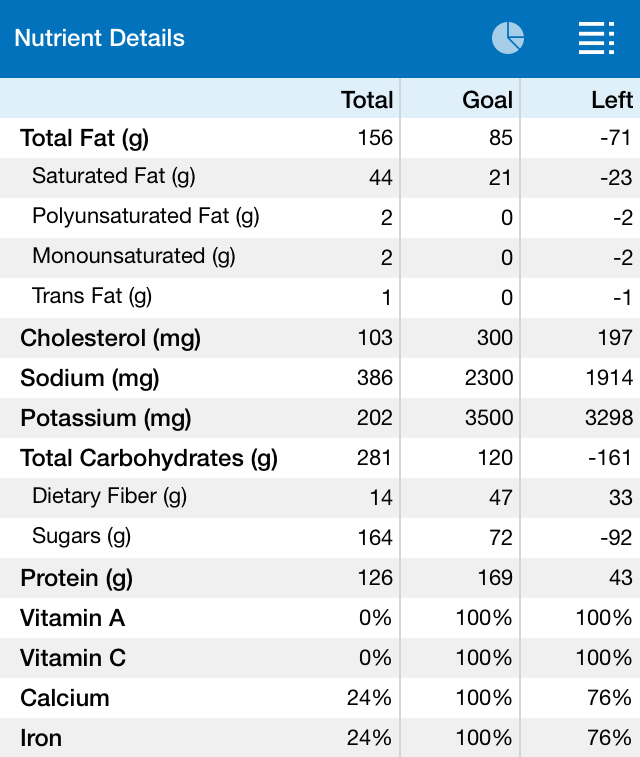 So a small portion with some milk and the yogurt, just about 480 calories but already 20 grams of carbs. 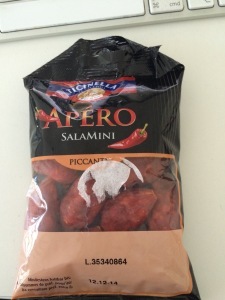 Same as yesterday, salad with chicken but to pep it up a bit I bought some salami. Low carb but with around 400 calories just for the salami and 640 for the whole lunch. Ouch. Not much left for dinner. Was planning some meat with broccoli & spinach but got invited over to a good friend. 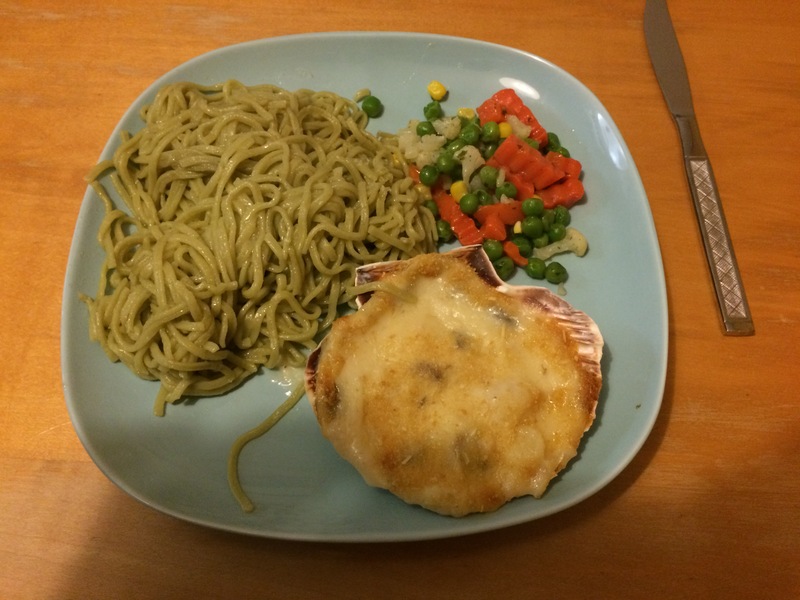 So ended up with some green pasta and some Scallops in Champagne sauce (In German: Jakobsmuscheln in Champagnersauce). All with a bit of vegetable. Hard to say how many calories and carb in total, the scallop is around 162 calories and 7.5 grams of carb, so pretty alright. I added 250 grams of normal spaghetti, might have been more. So 507 calories, give or take a handful. YES, we still have Kägi Fret in the office, so just had to take some of them. But then it went bad, went to the cinema (To see Hobbit #3) and well, yeah, Hmm, they have M&Ms there. No picture needed ;-) So bought a ‘small’ bag of 275 grams (I have bought way bigger ones before), holly cow, 1406 calories and 161 grams of carb, FAIL FAIL. Maybe I thought it was bad yesterday when I had 134 calories more than I should, well, I walked more today but had a whole whopping 1300 calories too much. Not only that but also 281 grams of carb. Oh dear, oh dear, I should probably go crying to bed now but that’s not going to happen. But no f…ing wonder I had problems with the weight in the past where such days where the norm (Not that I had a big bag of M&M’s very day). This was clearly an exception since I changed to low carb but that’s okay, I know what I’m doing. Actually, I plan some nice ‘who care about the carb’ food for Saturday evening and I will go ahead with that without feeling bad.